With IFA kicking off next week, the week before is usually packed with unintentional leaks. The newest leak is from Sony, who may have accidentally shown off two upcoming products in one promo that was placed on its Facebook page. 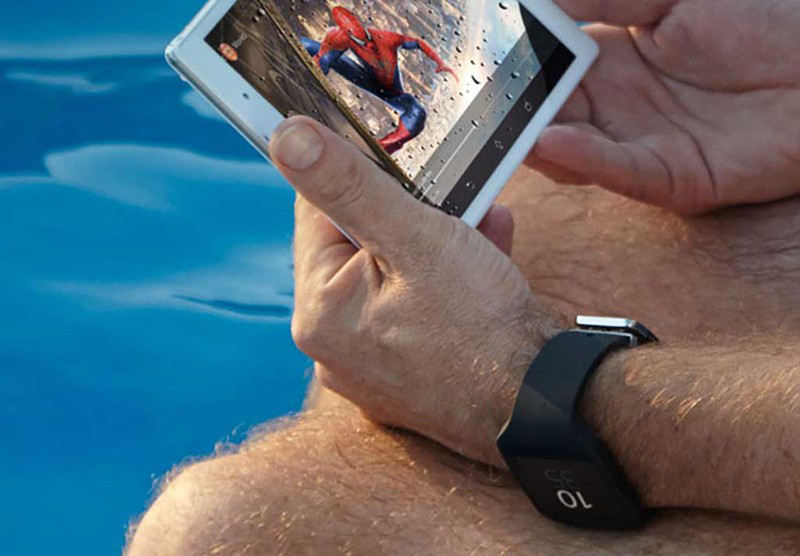 In the promo, which looks to have been taken down by now, a man sitting poolside is pictured using an unknown tablet, while also wearing an unknown smartwatch. The smartwatch, could either be an upcoming SmartWatch-branded device, or even better, Sony’s first Android Wear-powered smartwatch. The design, to us, gives off a Samsung vibe, especially in the clasp region of the bands. As for the tablet, the only upcoming device rumored from Sony that could match this description is the Xperia Z3 Tablet Compact. Much like other Sony-made tablets, it should be water resistant, meaning the gentleman who is holding it by the pool isn’t being completely irresponsible. In terms of specs, the Tablet Compact might come with a 7-8″ 1080p display and Snapdragon processor, but not much else is known at this time. Thankfully, as previously noted, IFA starts next week, and many of our unanswered questions will be satisfied.